hobbes Feb 26 2015 5:30 am love your performance in New Tales of Gisaeng! great! Genesis Dec 05 2013 12:05 pm Really like you as the dad in Princess Aurora, but can you reach out to your son and see that he is hurting over Aurora...don't force a marriage off on him that he doesn't clearly want....love doesn't work like the writers are portraying it. You don't forget about someone you truly love because you get married to someone else, and hope for love to grow. I really want to see your character in Princess Aurora be a dad to Seulhee, and tell him dispite your selfish wants, you want more for him to be happy...you know he's not happy. Maybe if you are like this, Seulhee will confess that he is in trouble...that he's sick. Please, if the writers have anykind of sense, they will bring you out as a more compassionate father in the next few episodes...before something tragic takes place. 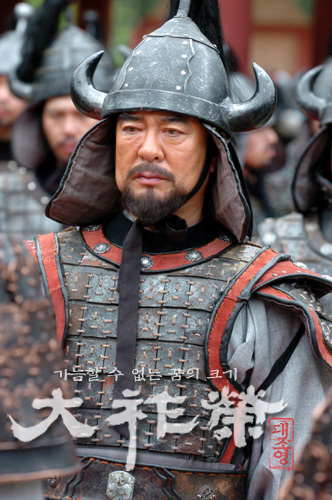 ACEE GEEH Mar 13 2013 5:32 pm In'the king dae Jo young' i like the role he played as dae'sfather and help to rev aid the country.he did the right things and help his son,he even give his life to save the country and its people. bellahyae Dec 08 2012 1:33 am i had to look up this gentlemen's name after seeing him in the series "the iron empress" ( 천추태후 ). almost every time they have a scene with him and he speaks, he gives this air and behavor which makes you think he really is from that time period. his acting is wonderfull! he gives a sence of honor and dignity which i have been looking for in the acting of these period series. to see the actors become there roles that goes beyond the clothing and makeup they wear, to become the person at that time. i really hope he is in more roles, he's a great actor! and i hope more series weather from the past or present being integrity honer and respect into there shows, really get into depth and thinking and behavour which helps to uplift all and harm none.